Mazda has given the MX-5 another subtle facelift with a new front end design and improvements to acceleration and braking. 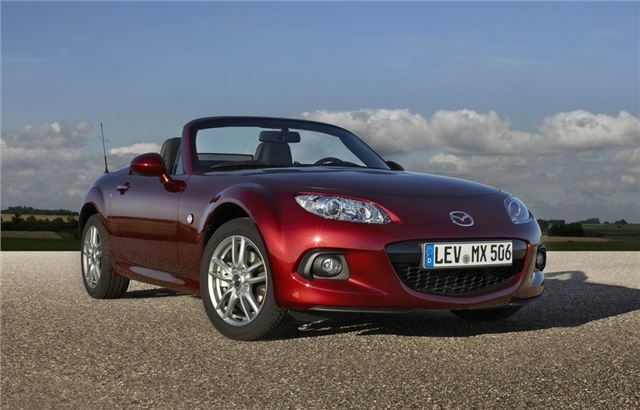 Both the standard MX-5 and the metal roofed MX-5 RC get the changes with the new versions on sale now. On the outside the changes are fairly small although Mazda does claim that it has an 'aggressive' front end with a deeper grille and reprofiled bumper to give a lower and wider appearance. There are also redesigned front fog light surrounds. Pedestrian safety has also been improved thanks to a new active bonnet system which raises the bonnet if the car hits a pedestrian, creating a larger crumple zone to help minimise injuries particularly to the head. Under the skin Mazda has improved acceleration on manual models with better throttle response especially at lower speeds. The brakes have also been improved thanks to changes to the vacuum brake booster so the MX-5 should be even better to drive. The resvised MX-5 comes in eight different paint colours including a new Dolphin Grey. As before power comes from a 1.8-litre petrol with 126PS and a five-speed manual or the 2.0-litre with 160PS and either automatic or manual six-speed transmissions.